Northern Ireland's Ben Doherty with Albania's Albi Doka is looking forward to tonight's match against Estonia. BEN DOHERTY is relishing the pressure of a high stakes double header for both club and country this week. And three days later he’s hoping to be involved in the mouthwatering North West derby clash against relegation threatened Finn Harps with much at stake for both clubs in Maginn Park. It’s a pivotal week for both teams and while Doherty is excited about Friday’s crunch derby clash in Buncrana, he’s focusing all his attentions on a tricky qualifier against the Estonians tonight. It’s a ‘must win’ match for Ian Baraclough’s troops who sit second in Group Two as they look to bounce back from defeat to Slovakia. And with a double header of qualifiers against group favourites, Spain and Iceland coming up in the new year, the Derry City defender knows the pressure is on to register a home win against an Estonia side without a win in four. It’s up to us to be on the front foot. It’s these games we need to be winning especially with games against big teams coming up. “These are the games we have to be winning,” said Doherty. “We beat them before (1-0 in Tallinn) but there are no easy international games. Teams are set up to be hard to beat. “Even the likes of Albania, people weren’t expecting them to be up to much but when you play against these teams who have 11 men behind the ball, they are hard to break down. 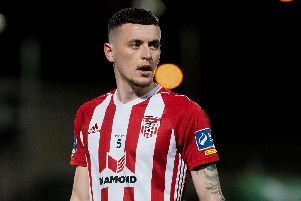 The defender is enjoying his breakthrough season with N. Ireland and his first full season with the Derry City’s senior side. With one more international clash in 2017, away to Albania coming up on November 10th, Doherty is hoping to finish the season on a high. “My club football is going well at the minute and I’m just hoping to carry it into the international games. Hopefully I can carry on what I’ve been doing. “Then on Friday it’s back to the ‘bread and butter’ but international games don’t come around too often and when you’re playing in them you need to perform. Looking ahead to Friday’s match against Harps, Doherty knows there is a lot at stake. “Friday night’s game will be a massive. Even for the fans it’s a massive game because they want the bragging rights. Doherty’s City teammate, Conor McDermott had been named in Baraclough’s 20 man squad but had to withdraw due to an ankle injury sustained against Drogheda. However, former Institute and current Coleraine midfielder, Ciaron Harkin has been called up and he’s ‘buzzing’ to be a part of the international set-up alongside his clubmate, Jamie McGonigle. “I am buzzing to be called-up into the N. Ireland Under-21 squad as I missed the last fixtures because I was in America,” he said. “I haven’t made an appearance yet at international level, but I hope that will change this time around.